Directed by Colin Trevorrow. Produced by	Frank Marshall and Patrick Crowley. Written by Rick Jaffa, Amanda Silver, Derek Connolly, and Colin Trevorrow. Release date: June 12, 2015. Jurassic World feels like the first true sequel - in terms of plot and spirit - to 1993's Jurassic Park. While there were two sequels between these films, they felt like cheap imitations that were darker, less enjoyable, and the exact types of cynical cash-grabs against which audiences nowadays rally. 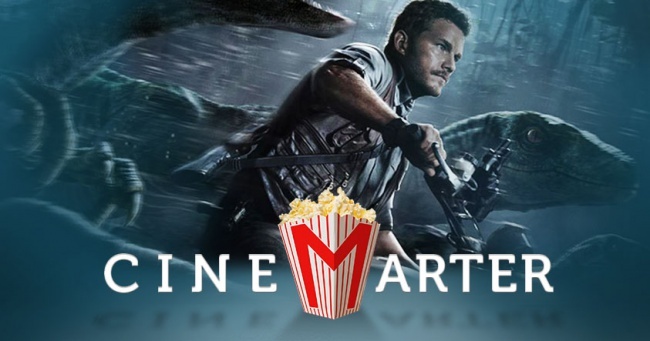 Jurassic World, on the other hand, comes to us as a thrill-ride of a movie, complete with all of the laughs and awes that we've come to expect from the franchise - assuming Jurassic Park was the only installment that we've seen. Set 22 years after Jurassic Park - and more or less ignoring any and all events that happened in the meantime - InGen, the company that brought dinosaurs back to life, has once again attempted to open a dinosaur-themed amusement park. The difference this time is that it's been a success. Before Jurassic World even begins, the titular park has already been running for several years. 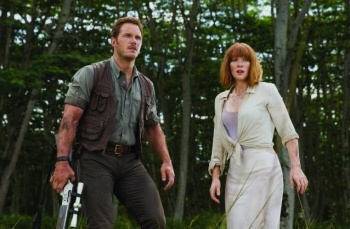 Owned by Simon Masrani (Irrfan Khan), who has taken over for John Hammond, and run by Claire Dearing (Bryce Dallas Howard), the park has seen large profits and has been far safer than anyone who saw the original film could have imagined. However, Jurassic World - both the movie and the park, actually - knows that its audience isn't going to be excited by "normal" dinosaurs anymore. We've seen them, and they're passÃ©. We're too cynical an audience in 2015 to be in awe of things from the '90s. So, the plot of the film sees the geneticists - led by the only returning character, Dr. Wu (B.D. Wong) - create an all-new dinosaur. It's a hybrid, named Indominus rex, and it becomes the central villain. No bonus points for guessing that it escapes from its captivity and begins to terrorize the park and its guests. To stop Indominus, the head Velociraptor trainer, Owen Grady (Chris Pratt), must team up with Claire, the dinosaurs he trains, and various other no-name cannon fodder. Claire's nephews (Nick Robinson and Ty Simpkins) are also visiting the park, because otherwise we wouldn't have named children in danger, so saving them becomes a top priority, too. Mostly, though, it's the same plot as all of the other films: people need to save themselves from being eaten from a giant dinosaur. This one's just bigger, smarter, faster, and more vicious. Essentially, what we have here is a "bigger is better" approach to filmmaking - something that is probably the most common way filmmakers make action sequels. The threat is more dangerous, the stakes are higher, and the budget is larger. The characters are still pretty shallow, and the plot is minimal - even if Jurassic World has more moving parts - but gosh golly isn't it fun to watch dinosaurs tear other dinosaurs and people to shreds?